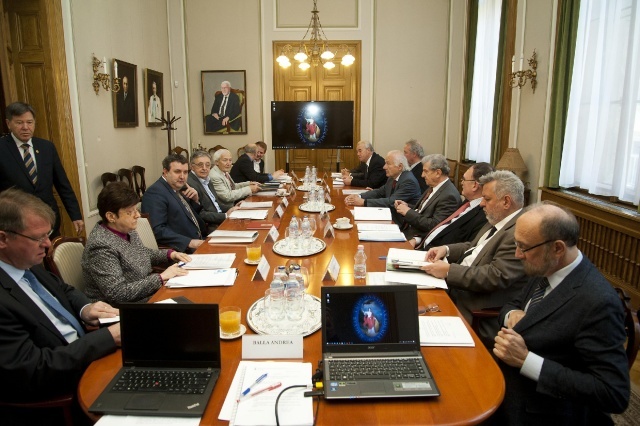 The Scientific Presidential Committee of the Research Network of the Hungarian Academy of Sciences had its first meeting in the main building of Academy on 16 November 2018. The Academy was represented by the following scientists at the Committee’s first meeting: Ádám Török, Secretary-General of the MTA, Beáta Mária Barnabás, Deputy Secretary-General of the MTA, Lajos Vékás, Vice-President of the MTA and co-Chair of the Committee, Tamás Freund, Vice-President of the MTA, András Kertész, Chair of Section I of Linguistics and Literary Scholarship, all of whom are academicians, and Gábor Prószéky, doctor of the Academy, Director of the Research Institute for Linguistics. The Ministry for Innovation and Technology (ITM) was represented by the following scholars: Miklós Maróth, full member of the Academy, co-Chair of the Committe, Péter Sótonyi, doctor of the Academy, Rector, Péter Závodszky, full member of the Academy, Zsolt Fülöp, doctor of the Academy, András Lánczi, CSc Rector. Béla Merkely, doctor of the Academy and Rector was held up elsewhere and arrived somewhat later while Miklós Kásler, doctor of the Academy and Minister of Human Capacities could not take participate in the meeting due to other engagements. The session began with short opening speeches delivered by László Palkovics, Minister of Innovation and Technology and László Lovász, President of the Academy. Both speakers emphasized the importance of responsibility towards science. When the executives left, the Committee had a constructive discussion of the points on the agenda. 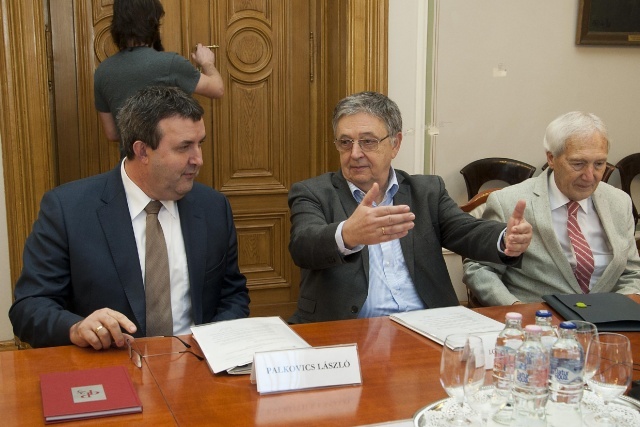 The draft resolutions were presented to the committee members by the two co-Chairs, Lajos Vékás and Miklós Maróth academicians. to determine principles for the maintenance and development of the excellence grant system for basic research in Hungary. The draft resolutions for the above points were all unanimously accepted by the Committee. The draft resolutions will be presented to the President of the Academy and the Minister of ITM.